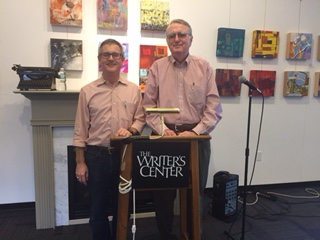 Art Taylor, who teaches at George Mason University, left, read from his new mystery “On the Road,” a novel in stories Sunday. Novels in stories are very difficult to do. Keeping character’s voice is a constant challenge and high hurdle. Can’t wait to read it. He suggested after our readings were through the session could have been named “On the Road, On the Seas.” Would have worked for me. 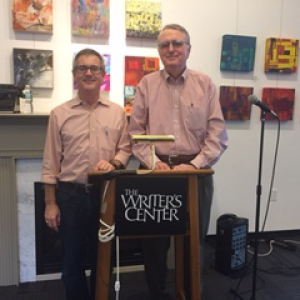 A special thanks to Sunil Freeman at the Writer’s Center for arranging this event. It was great to be back in Bethesda in a place that helped me greatly. previous post: You Can’t Make This Stuff Up! next post: The ‘Real Santa’ and Can We Go Again?